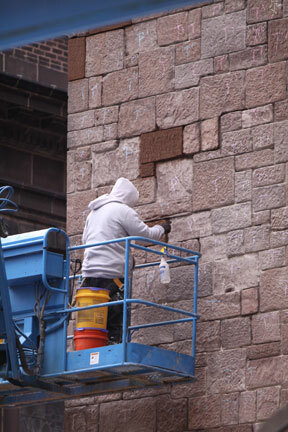 a worker replaces the stones high on the back wall of the cathedral in Philadelphia. The Preservation Alliance of the Greater Philadelphia Area has selected the Cathedral Basilica of SS. Peter and Paul, the mother church of the Archdiocese of Philadelphia, to receive one of its 2012 Preservation Achievement Grand Jury awards. The award will be presented at the 19th annual Preservation Achievement Awards Luncheon May 8 in Philadelphia. A two-year overhaul of the exterior of the iconic center city Philadelphia cathedral was completed early this year. The project included a thorough cleaning of the aqua-toned oxidized copper dome, cleaning and testing all exterior stone, repairing all exterior damage caused by 100 years of weathering and adding a new gold leaf finish to the 11-foot cross at the top of the dome. Every single stone was examined and cleaned, and past patchwork that was structurally unsound was removed and replaced, not only for structural purposes but also for aesthetic reasons. Project architect Stephanie Valentine traveled to the Cathedral Basilica weekly throughout the two-year project to inspect work as it was completed. “This award is the first step in the total preservation and renovation of the Cathedral Basilica,” said Msgr. Arthur E. Rodgers, rector of the cathedral. With the renovation of the exterior complete, the focus will now turn to the magnificent interior. It has not undergone a major renovation since the late 1950s, when a new main altar and baptistery were installed and dedicated, as well as the installation of new lighting. With funds from the Heritage of Faith—Vision of Hope campaign, the Cathedral Basilica’s interior will receive a complete overhaul. Projects will include renovation of the lighting, heating and air conditioning, replastering and painting, refinishing all pews and adding a new finish to the marble floors. The cathedral (the title “Basilica” was not bestowed until 1976) was built between 1846 and 1864, under the commission of then Bishop of Philadelphia Francis Kenrick, who died in 1851, 13 years before its completion. The beginning of the cathedral’s construction was just two years after the Philadelphia Nativist Riots of 1844, which were uprisings throughout the city fueled by rising anti-Catholic sentiment and the growing population of Irish Catholic immigrants. The cathedral was built in a Roman-Corinthian style of architecture, modeled after the Lombard Church of St. Charles (San Carlo al Corso) in Rome. Nan Gutterman, project manager at Vitetta Corp., nominated the Cathedral Basilica for the preservation award. The company specializes in architecture, engineering, planning, historic preservation and renovation, interior design and security design. “We believe the project deserved recognition, as well as the Archdiocese for carrying it out,” Gutterman said. The Preservation Alliance’s annual event recognizes outstanding achievement in the field of historic preservation throughout the Philadelphia region. It celebrates efforts to maintain the historic fabric of Southeastern Pennsylvania. The coming renovation projects of the Cathedral Basilica are expected to be completed over time as money allows, thus preserving the beauty and history of Philadelphia’s Catholic cathedral for future generations.